Tuesday, July 15, 2013, Derry, New Hampshire: – Mark Donovan announced today the release of his first novel, “Nano Surveillance”, a fast paced political techno-thriller. “Nano Surveillance” is a 352 page novel that offers a frightening glimpse into the possible future of surveillance using nanotechnology. Where a government, or others, can silently infect specific targets or an entire population with bio-nanoscopic material that renders its unwitting victims’ lives an open book to be overseen and controlled. “Nano Surveillance” is a technical thriller that takes the reader on a journey to places all over the western hemisphere. It’s also replete with aeronautical scenes that aviation enthusiasts will fully enjoy. Set in the northwestern part of the United States, engineer and pilot Dave Henson and his team of high tech entrepreneurs operate a nanotechnology surveillance company out of McCall, Idaho. After witnessing the economic collapse of the country, Dave and his team are intent on reversing the political and economic direction of the country. Ultimately they plan to bring a new level of transparency between the federal government and the public. To do so they’ve developed fantastic new nano surveillance technology to expose the corrupt alliance between the current political administration, the national press corps, and a handful of international billionaires with global political and financial agendas. While NSurv, and news reporter Dana Cogswell, work to expose the corruption in Washington D.C., the President announces new plans to end global climate change and restore the country’s economy. However, the President’s plans run sinisterly deeper, and include the required use of personal tracking sensors to be installed in every automobile and product sold in the country. If the President’s plans become law, Henson’s team is convinced it will destroy the country and provide the government with unfettered surveillance of the public. The NSurv team quickly finds itself intertwined in a deadly war with the President and his allies. 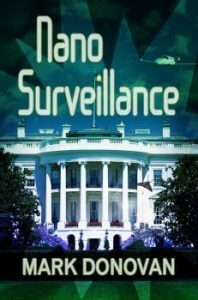 As NSurv works to capture and report the ultimate story to topple the administration, the President and his allies stop at nothing to protect their self interests and to capture NSurv’s new surveillance technology. “Nano Surveillance was a marvelous read…It held my interest during the entire fiction,” said Ken Admire, one of the first to read the novel. “Nano Surveillance is available in Ebook and paperback formats, and can be purchased at Amazon.com and Barnes&Noble.com. It is priced at $0.99 in Ebook format, and $14.99 in paperback. Mark Donovan lives in New Hampshire and has spent nearly three decades working in various engineering and marketing roles in the high tech field around the New Hampshire/Boston area. His career has provided him with a breadth of knowledge in semiconductors, computers, telecom, defense, and sensor technologies. He holds a Bachelor of Science degree in Electrical Engineering and an MBA. In addition, he holds a private pilot license. Through his website, www.HomeAdditionPlus.com, he has also authored 32 eBooks and 2,000+ articles on a wide variety of home improvement topics. Many of his articles are syndicated around the United States in various print and online outlets.